The famous Australasian group will play their first ever gig in the west of Ireland this month. Crowded House’s bass player Nick Seymour thought it was time he repaid some of the surfers along the west coast. The Dublin-based Aussie has made several trips west since he moved to the capital 13 years ago and has been hosted and entertained by surfers from Lahinch in Clare to Sligo, only too glad to welcome a member of the famous Crowded House. “I’ve been dining out on being in Crowded House and have no proof of it - I could be making it all up for all they know,” jokes Seymour when The Mayo News caught up with him last week. 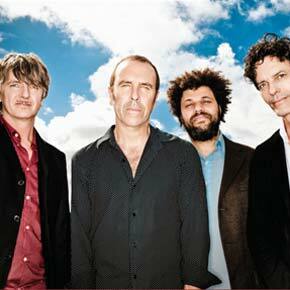 And so explains the tale of how Australasian group Crowded House, famous for iconic songs such as ‘Weather With You’ and ‘Don’t Dream It’s Over’, will play in Castlebar this month, performing in the TF Royal Hotel and Theatre on Saturday, May 29. The band are headed up by Kiwi Neil Finn (vocals) and have been in existence since 1986 when Finn and drummer Paul Hester hooked up with Seymour to form the band. Finn and Hester, who sadly passed away in 2005, had previously been in a band called ‘Split Enz’ before Seymour pushed himself into contention to join the three-piece as he colourfully explains. “I went to the Split Enz break-up party and, when he was langered drunk, I told Neil that not only did I want to perform with him, but I thought he should put me in a new band with him and he acceded. So anytime anyone comes up to me now when I’m in the same state and tries to do the same, I always like them for it because I have to recognise my own origins,” laughs Seymour. He chuckles even more when you read him a line from a Crowded House 2010 mini-bio penned by Finn which gives his version of their first encounter: ‘we found our bass player Nick Seymour, fresh from the catwalk, clearly loving the attention’. “It sounds much more glamourous than it was,” replies Seymour, laughing uproariously at what his lead singer had to say. “I was studying in school and I was nixing, doing whatever I could get. So I modelled for Neil’s wife and a few of her girl friends, who had their own clothing firm. I was a bit of a boy around town alright,” he conceded. Four successful albums later, Crowded House were well and truly established. ‘Weather With You’ would become their most recognisable single but, by the mid 90s, a split seemed inevitable and the trio went their separate ways in 1995. By that stage Nick Seymour had bought a property in Dublin and soon came over to make it his home. An Irish love brought him there. A love for Ireland kept him. “I bought a property on Exchequer Street in Dublin (just off Grafton Street) when property prices were at rock bottom in the early 90s and I had to convince the auctioneer to let me buy it! I wanted to turn it into a warehouse type apartment. So, after the band broke up, I said I would do the property up and see what Dublin was like. It was a European capital, English speaking and not English! My relationship broke up a few months later but I fell in love with Dublin and Ireland. Bands like BellX1 and The Walls have benefited from his advice and guidance. But the calling of Crowded House was always there. In late 2005 Finn and Seymour reformed along with Mark Hart and Matt Sherrod. They’ve released a new album but Seymour admits touring is what makes them tick. The band’s tour of the UK, Ireland and Europe commences tonight in Newcastle, England and Castlebar is up on Saturday week. Seymour can’t wait to get up and running.